Having extra help on the computer at the time of writing is not superfluous because committing misspellings, skipping letters or writing bad words is something that will always happen, even more, when we are in a hurry and do not review what we wrote before. send it or save it. That’s why macOS High Sierra has its own dictionary and its autocorrect, which users can activate or deactivate whenever they want. If you still do not know this tool and want to know how you can start using it on your computer, here are some simple steps so you can do it quickly. The first thing you should know is that the autocorrect option can be activated and deactivated in all applications, or in a specific app, so the decision should be made according to the use you give to writing from the computer. If you want to activate the autocorrect, you must enter System Preferences> Keyboard> Text, and there you must check the box ‘Correct spelling automatically’. By activating this function, the operating system will correct the words we have written incorrectly automatically. Even in this space, it is possible to add certain combinations of letters that we want to be replaced by certain words or complete sentences. The above can be done more easily. To do this, you must press ⌘ at the same time on the spacebar to open the Spotlight search. When you see the bar on the screen, type System Preferences and there follow the same steps as mentioned above. To accept the suggestions, you just have to keep writing so that the function corrects the word automatically. If on one occasion you want to ignore the suggestions, you must press the Escape key (Esc) and continue writing. To undo the automatic corrections, you must locate the insertion point after the word so that its original spelling appears, and there you must select it. You can also click on the word with the Control (Ctrl) key pressed to display its original spelling and select it. 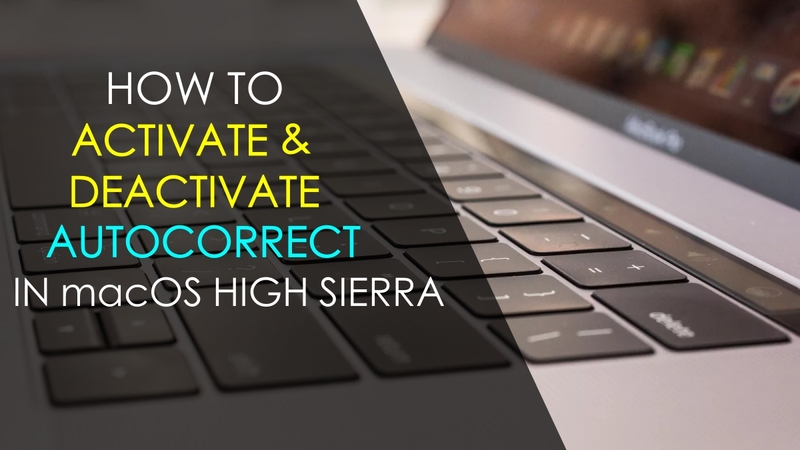 This is how we can Turn on or Turn off the autocorrect option in our macOS high sierra. I hope this article helps you regarding the autocorrect settings. If you have any queries regarding the above method let us know them in the below comment box and we will get back to you as soon as possible to solve all your queries. Are you facing any issues with your MacBook Pro or Air? Then write them in the below comment box and we will get a solution for you. Which MacBook Pro or MacBook Air you are using?